The European Union has launched an investigation into alleged "dumping" of solar panels into the region's markets by Chinese manufacturers. 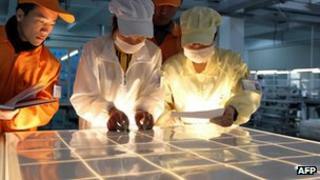 The probe comes after European manufacturers alleged that Chinese firms were selling panels below their market value. There have been allegations that China is helping its firms to export cheaper panels by providing subsidies. If found guilty, Chinese firms may face anti-dumping tariffs on panel exports. "The investigation will determine whether the product under investigation originating in the country concerned is being dumped and whether the dumped imports have caused injury to the Union industry," the European Commission said in a statement. "If the conclusions are affirmative, the investigation will examine whether the imposition of measures would not be against the Union interest." In May, the US imposed similar tariffs of about 31% on solar panel imports from China. The European Union is one of the biggest markets for China's solar panel exports. China exported nearly 21bn euros ($26bn; £17bn) worth of solar panels and components to the region last year. That amount is expected to grow even further, amid a push by the EU for increased use of renewable energy. However, there have been fears that increased imports from China have hurt European panel manufacturers. For their part, Chinese firms have urged Beijing to respond to a threat of European anti-dumping restrictions, raising fears that the dispute may escalate into a trade dispute. Last week, German Chancellor Angela Merkel urged Chinese and European authorities to resolve the matter amicably by holding talks. But she called for more transparency from Beijing about incentives given to the sector. "My plea is that everyone be transparent, that they lay their cards on the table about how they produce," she remarked during her visit to China.